Harness the power of the iPad and change the way you conduct inspections forever. Conduct inspections quickly, efficiently, and simply right from the field…saving time, money, and headaches! This is so much better than paper! It's a great piece of software. The whole agency is excited about this application, that HDS is stepping up! Designed to provide you with all of the information you need right at your fingertips, HDS Entry is an easier way to conduct inspections. Integrates seamlessly with your HDSWin system and is the simplest and easiest-to-use product available. No more duplicate data entry! Conduct an inspection and transmit the results wirelessly to the office from the field. 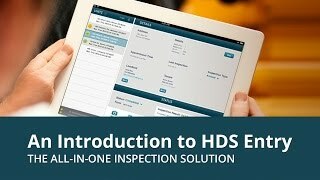 HDS Entry’s seamless integration with HDSWin means you can conduct more inspections per day saving staff time and dollars. HDS Entry supports any inspection form (including custom forms), allows rescheduling of appointments on site, and lets users take photos, collect signatures, and email inspection results from the field. Give us a call at (608) 786-2366 to speak with one of our representatives.